Jan. 11 (Bloomberg) — Cotton prices jumped the most allowed by ICE Futures U.S. after the worst floods in half a century damaged crops in Australia, the world’s fourth-largest exporter. (BBC NEWS) — Food prices in Australia could rise by as much as 30% in the coming months as a result of the Queensland floods, it has been warned. The investment bank JP Morgan says it expects food prices to spike, which will also push up headline inflation. 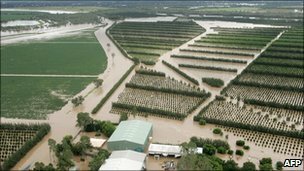 The bank’s chief economist in Australia said 50% of crops had been affected by the floods, with 20% wiped out. Stephen Walters also told the BBC that rises in Australia could have a knock-on impact on prices in Asia. JP Morgan also said that coal mining had been significantly damaged and estimated that the floods would shave 0.4% off GDP growth in the last quarter of 2010 and the first three months of 2011. The worst floods to hit Queensland for more than 50 years have left 10 people dead and more than 70 missing. There have been reports of panic-buying by some Brisbane residents who fear rising floodwaters and further heavy rain. “Food prices are likely to go up because shortages will emerge,” Mr Walters told BBC World Service. He said crops likely to be affected include wheat and other grains, sugar cane, as well as fruit and vegetables. But he said the fourfold increase in prices that was seen in 2006, when Cyclone Larry wiped out the banana crop, was unlikely to be repeated because there are other parts of the country that produce fruit and vegetables. But he warned of the impact that could be felt outside Australia. “The Queensland region, in particular, is one of the world’s biggest exporters of sugar cane as well as wheat, so they’re two commodities for which we know the prices are going to spike up,” he said. Oh, It Was The John P. Wheeler III Who Was Involved In The Barksdale-Minot Nuke Incident Who Was Found In A Landfill! This issue of floods will result in an increase in food prices as the production will decrease while the demand for agricultural products will increase. This will be a barden to poor consumers as they will face high prices for staple foods.